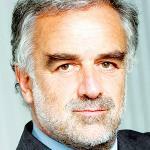 Luis Moreno-Ocampo was the first Prosecutor (June 2003–June 2012) of the new and permanent International Criminal Court. His office was involved in twenty of the most serious crises of the 21st century including Iraq, Korea, Afghanistan, and Palestine. He conducted investigations in seven different countries, presenting charges against Muammar Gaddafi for crimes against humanity committed in Libya, the President of the Sudan Omar Al Bashir for genocide in Darfur, the former President of Ivory Coast Laurent Gbagbo, Joseph Kony, and the former Vice President of the Democratic Republic of Congo Jean Pierre Bemba. Previously, Moreno-Ocampo played a crucial role during the transition to democracy in Argentina, as the deputy prosecutor in the “Junta trial” in 1985 and the Prosecutor in the trial against a military rebellion in 1991. He was a Visiting Professor at Stanford University, Harvard University, and “Distinguished Visiting Fellow” at New York University Law School. After the end of his tenure as ICC Prosecutor, Moreno-Ocampo was the chairman of the World Bank Expert Panel on the Padma Bridge project. He is now in private practice at a New York law firm and Senior Fellow, Jackson Institute for Global Affairs at Yale University.